This is constructed by the DiagnosticsEngine::Report method, and allows insertion of extra information (arguments and source ranges) into the currently "in flight" diagnostic. When the temporary for the builder is destroyed, the diagnostic is issued. Note that many of these will be created as temporary objects (many call sites), so we want them to be small and we never want their address taken. This ensures that compilers with somewhat reasonable optimizers will promote the common fields to registers, eliminating increments of the NumArgs field, for example. Definition at line 1044 of file Diagnostic.h. When copied, this "takes" the diagnostic info from the input and neuters it. Definition at line 1114 of file Diagnostic.h. Definition at line 1125 of file Diagnostic.h. Definition at line 1170 of file Diagnostic.h. Referenced by addFixitForObjCARCConversion(), clang::PartialDiagnostic::Emit(), and clang::operator<<(). Definition at line 1176 of file Diagnostic.h. Definition at line 1165 of file Diagnostic.h. Referenced by clang::PartialDiagnostic::Emit(), and clang::operator<<(). Definition at line 1149 of file Diagnostic.h. Definition at line 1157 of file Diagnostic.h. Definition at line 1077 of file Diagnostic.h. Force the diagnostic builder to emit the diagnostic now. 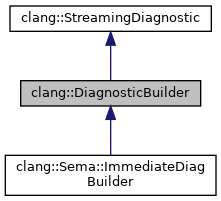 Once this function has been called, the DiagnosticBuilder object should not be used again before it is destroyed. true if a diagnostic was emitted, false if the diagnostic was suppressed. Definition at line 1093 of file Diagnostic.h. Definition at line 1072 of file Diagnostic.h. Retrieve an empty diagnostic builder. Definition at line 1130 of file Diagnostic.h. Determine whether this diagnostic is still active. Definition at line 1084 of file Diagnostic.h. Conversion of DiagnosticBuilder to bool always returns true. Definition at line 1147 of file Diagnostic.h. Definition at line 1135 of file Diagnostic.h. Referenced by PrintExpected(), PrintUnexpected(), and clang::VerifyDiagnosticConsumer::UpdateParsedFileStatus(). Definition at line 1045 of file Diagnostic.h. Definition at line 1046 of file Diagnostic.h.